11.00am - Heritage walk of Templeogue, meet at The Morgue. 7.00pm - Tallaght Village Tour, meet at the Library. 7.00pm - Crafty Chatters!!! July & August Crafty Chatters will meet every Thursday evening 7-9pm (Summer schedule), Small Hall, come along with whatever craft you are working on or learn a new one and enjoy the chat! All welcome! (TBC). 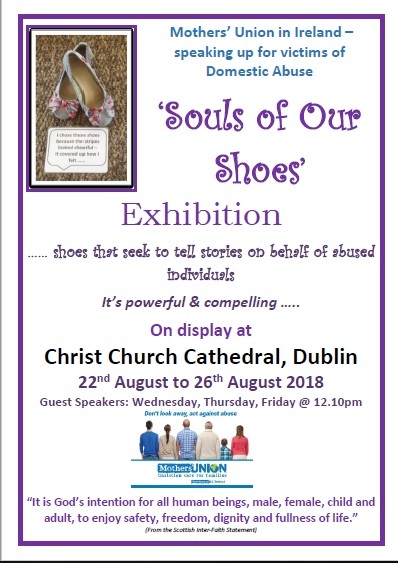 9.30am – Mothers Union ‘Speaking up for Victims of Domestic Abuse’ Exhibition on display in Christchurch Cathedral. 11.00am - Monastic Tallaght talk in Tallaght Library. 12.10pm - MU Domestic Abuse talk, Christchurch Cathedral 12.10pm – 12.40pm Wednesday and Thursday (23rd) Friday(24th). 7.30pm - Mothers’ Union Committee in the kitchen of the Parish Centre. 11.00am - Tour of the Churchyard at St Maelruain’s.